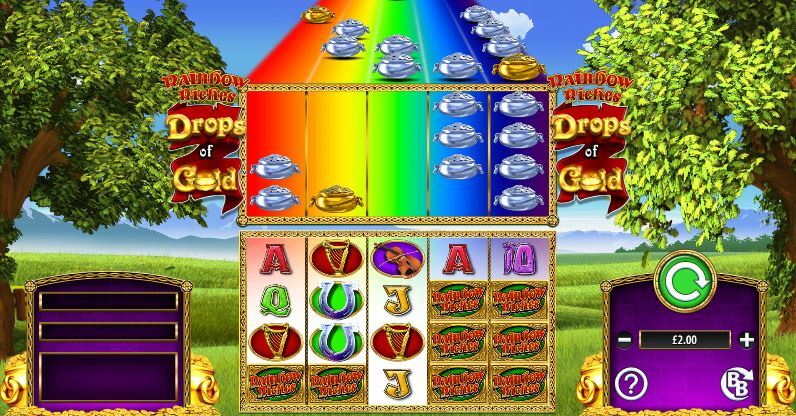 Rainbow Riches: Drops of Gold is yet another slot game bound to come with a little Irish luck. Hailing from Barcrest and available to play at Slot Games, this game is sure to have you crossing your fingers and your toes as you try to score a big win. We expect an Irish themed slot to look as beautiful as the Emerald Isle itself and Drops of Gold certainly does not disappoint. From the rolling greenery of the background to the rainbow-coloured upper reel, this game is a feast for the eyes. Symbols available to you include the 10, Q, J, K, and A array familiar to anyone who dabbles in slots as well as some fun bonus tiles. These include a silver horseshoe sure to bring good luck to any player, an Irish harp, a fiddle, a trio of fly agaric mushrooms, and the highest paying tile – the Rainbow Riches symbol. There is also the colourful upper reel which contains the silver and gold pots which form an integral part of the Drops of Gold bonus, as well as some other scatters used to trigger the bonus features. Keep your eyes peeled! Drops of Gold may seem confusing at first but it is surprisingly easy when you get the hang of it. Use the screen on your right to enter your desired bet and then hit the green spin button to see if you have a win. With paylines numbering between 50 and 200, you have plenty of opportunities to hit a winning combo. If you are unsure about any of the paylines or the values of the symbols, you can always click the information button in the right-hand screen beneath your bet. This slot has more chances to win than there are colours in the rainbow and they can be found with the lucrative bonus features available. Firstly, there are many chances to earn yourself some Free Spins. All you need is 3 or more Bonus symbols across your reels at the end of the spin. This will grant you 8 free spins and any more Bonus tiles will grant you another 4 free spins! One of the biggest attractions of this game is the Drops of Gold Bonus. Whenever you see a Drops of Gold symbol after your spin, watch as the pots on the upper reel come crashing down to become beautiful, rainbow wild tiles. The silver pots give you a wild substitute for any symbol except the Bonus while the gold substitutes for any other symbols on the reels. Both of these amazing bonuses are available throughout the other bonus games. With them in hand, you are bound to win big. For the adventurous among you, there are also 3 Big Bet options. Just click the icon beneath the spin and choose from bets of £20, £30, and £50, each with their own stakes and their own chances to win big across 5 spins. For the ultimate slot fanatic, there is the chance to earn some serious cash here. Although maybe not the best for beginners, any slot veteran wishing to play with some big bets is sure to love this game.